Officials inspect the scene of a landmine attack in a rubber plantation in Muang, a district of Yala province in southern Thailand, July 5, 2018. 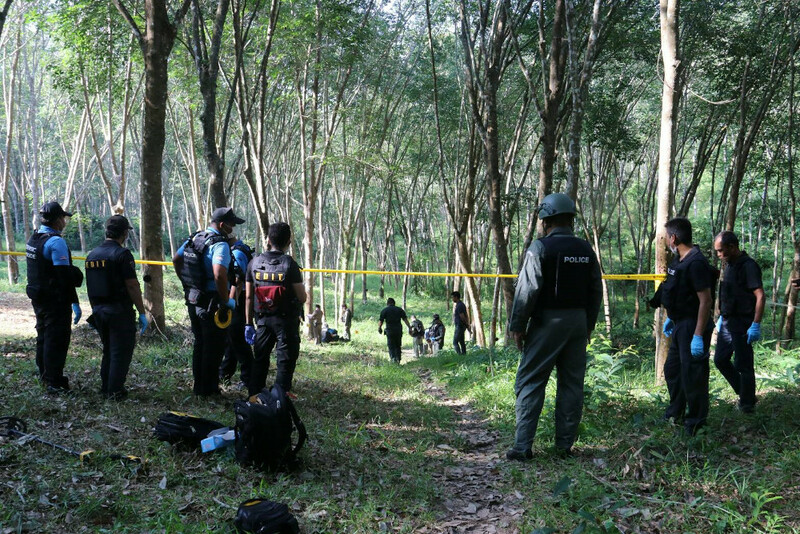 A rubber plantation worker in Thailand’s Deep South was seriously injured in a landmine explosion Thursday – the fifth such attack in a week in the insurgency-stricken region, according to officials – bringing local and international condemnation. Rubber farmer Jarin Junluek, 47, suffered shrapnel wounds in the pre-dawn blast in the Muang district of Yala province, police said. “The explosion and shrapnel caused a lot of wounds to his body, hands, arms and eyes. He was in serious condition and was transferred to Yala Hospital,” Capt. Pattana Kaenkaew told reporters at Muang Yala police station. The improvised landmine was triggered when the worker snapped a nylon cord attached to the device, Yala Police Bureau commander Krisda Kaewchandee said. Thursday’s explosion was the fifth landmine attack at rubber plantations in several districts of Yala since June 28. Those attacks seriously injured five people, all Buddhists, according to official reports, while police said officers successfully defused one landmine. The rubber industry is one of the main sectors of the economy in the impoverished and predominantly Muslim Thai Deep South, where a separatist insurgency has raged for decades. The attacks began last week when a local woman, Wipawan Plodkaenthong, 34, lost her leg and was blinded by a landmine explosion as she was working in a plantation in Yala’s Yaha district. “She had two children and from now on her husband needs to shoulder all the burden. And now how can we go out to work when nowhere is safe?” a neighbor who declined to disclose her name told BenarNews. New York-based Human Rights Watch, a co-founder of an international campaign to ban landmines that led to the 1997 Mine Ban Treaty, claimed that Barisan Revolusi Nasional (BRN), the most powerful insurgent group in the Deep South, was responsible for these attacks. “Separatist insurgents have used landmines to maim rubber plantation workers and seriously disrupt the daily life of people in Thailand’s southern border provinces,” Human Rights Watch said in a statement Wednesday, calling on ethnic Malay Muslim BRN-affiliated rebels to cease using landmines to attack civilians. On Thursday, a Buddhist network in Yala condemned the attackers, saying the blasts were aimed solely at Buddhist Thais and fueled hatred between the faiths. “All the injured are innocent Buddhist people. The attacks did not only cause hardship among the Buddhists, the real minority in the area, but they cause disunity and hatred between identities,” the Buddhist Network for Peace said in a statement. The network also called on the government and insurgents to speed up a regional peace process and bring the attackers to justice. “The insurgents used landmines in rubber plantations to injure or amputate the innocent is something deserving of condemnation. The government must seriously scan the areas to save lives and ensure safety of the innocents,” Angkhana Neelapaijit, a member of the national human rights commission, told BenarNews. Since 2015, Thailand’s military government has held several rounds of negotiations with a panel representing various insurgent groups in the Deep South, but both sides so far have not agreed to a geographically limited ceasefire, which is seen as a linchpin to future prospects of peace in the Deep South. Nearly 7,000 people have been killed in the Malay-speaking Deep South region since a separatist insurgency re-ignited in 2004.